Arsenal travelled to Everton in the midst of what seems to be a mini injury crisis. Granit Xhaka and Laurent Koscielny missed another game after being absent against Newcastle while a niggle for Aaron Ramsey meant he was only fit enough to start from the bench. The defence was the same as the one that kept a clean sheet against Newcastle with Shkodran Mustafi, Sokratis and Nacho Monreal forming a back-three. Ainsley Maitland-Niles and Sead Kolašinac continued as the wing-backs. The biggest talking point and the area which really cost Arsenal the game was in midfield. Mattéo Guendouzi started alongside Mohamed Elneny in midfield, a combination which didn’t instil a great deal of confidence. Up front, Henrikh Mkhitaryan and Mesut Özil started on the left and right flanks respectively as Alexandre Lacazette led the line. Everton initially put out the same lineup as the one which won the previous week but were forced into a late change as Jagielka replaced Michael Keane. With Richarlison and Bernard starting on the flanks, the Toffees were perfectly set up to exploit the high line held by the Arsenal defence. In midfield, André Gomes started alongside the industrious Idrissa Gueye. Dominic Calvert-Lewin led the attack. Considering the injuries and suspensions he has to deal with, Emery can be forgiven for selecting a combination of Guendouzi and Elneny in midfield. Unfortunately, the duo were extremely poor on the day and were constantly being overrun by an enthusiastic and energised Everton side. Granit Xhaka might not be everyone’s cup of tea but the debacle in midfield really showed how much Arsenal struggled without the Swiss acting as a deep-lying playmaker. Whenever Arsenal play a 3-4-3 or 3-4-2-1, their overall performance is decided, more often than not, by the combination in midfield. Predicting that Guendouzi and Elneny would fail to impose themselves, Everton were quick to press the duo intensely forcing errors and preventing either from looking for forward passes. This approach paid off as Guendouzi was booked in the sixth minute and Elneny was invisible for the entirety of the first half, after which he was hauled off. Elneny is a far too limited midfielder to be starting such games and Guendouzi seemed overwhelmed and struggled positionally. 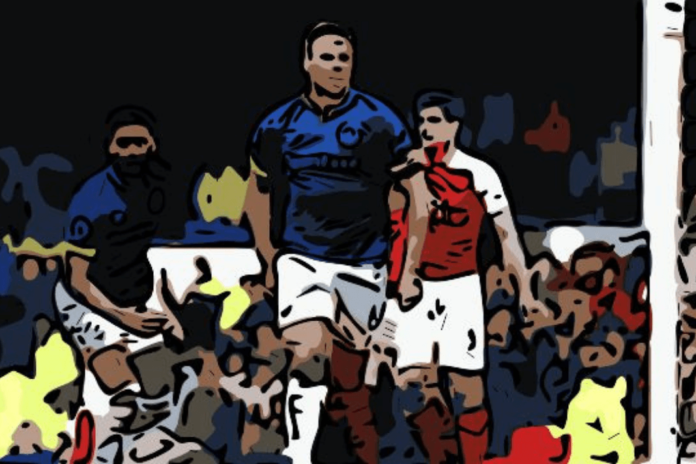 As Everton dominated the midfield numerically and physically, Arsenal’s buildup was slow and negative as a lack of passing options and movement meant the ball was constantly passed sideways between the centre-backs. As we’ve seen in such situations, the stunted buildup meant that Mesut Özil was forced to drop deep in order to try and make something happen, causing an imbalance in the attacking third. This rendered Arsenal completely toothless. Over the 90 minutes, the visitors registered just two shots on target compared to Everton’s six. It has to be said that Arsenal were very lucky not to return to London on the back of a hiding in Merseyside. Everton played a good game and had a clear game-plan to exploit Arsenal’s weaknesses. A key area they targeted was the tendency of Arsenal’s wing-backs to stay advanced. Both Maitland-Niles and Kolasinac were very poor and the latter was substituted after the first half for Aubameyang. Arsenal have always had the tendency to over-expose their flanks and this is exactly what Everton did with Bernard and Richarlison running down the flanks. When Arsenal had possession, the Everton wingers would stay higher up the pitch so that they could really hit the Gunners on the turnover of possession. When they regained possession, Everton would immediately launch a ball either to the flanks or down the middle for Calvert-Lewin. Jordan Pickford’s solid distribution aided this tactic as Arsenal had neither the time nor the speed to catch either winger. Calvert-Lewin was a great presence up top for the Toffees as the Englishman was a constant menace for Mustafi and Sokratis. Over the entirety of the game, Arsenal lacked an impetus and were devoid of ideas. Over the course of the season, the reliance on overlapping play has increased greatly and similar to the loss away to West Ham early in the season, when the wing-backs were nullified, Arsenal struggled to find other areas to penetrate. This brings the question as to whether the Gunners should play a back-three as much as they have been over the season. Both systems, a back-three and four have their obvious pros and cons. Looking at a back-three, it’s clear that when Emery’s side play such a system, dynamism in midfield is a must. Without this dynamism, the side genuinely does struggle to create chances and becomes imbalanced. In situations where it isn’t possible to play the suitable midfield, it would be more suitable to revert to a back-four as it provides the extra man in midfield. In this game, someone like Iwobi playing on the wing would have been a better option than relying so heavily on the wing-backs. The loss is sure to hurt and leaves Arsenal with very little room for error over the remaining games. Worryingly, the Gunners still have daunting away games to Leicester and Wolves remaining on their schedule. Given the awful record away from home, Unai Emery needs to find a way to fix this chronic lack of confidence and heart that has crippled Arsenal over the past few seasons. Looking forward, the Gunners host Napoli in the Europa League this Thursday. If the Gunners are to get a result, they’ll have to be at their absolute best against Carlo Ancelotti’s side.